コピーライト表記 Game (C) 2006 Sony Computer Entertainment Europe. 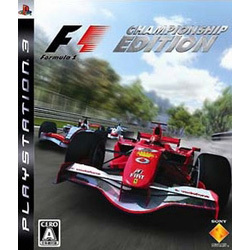 Published by Sony Computer Entertainment Inc. Developed by SCEE Studio Liverpool. An official product of the FIA FORMULA ONE WORLD CHAMPIONSHIP. FORMULA ONE, FORMULA 1, F1, FIA FORMULA ONE WORLD CHAMPIONSHIP,GRAND PRIX and translations thereof are trademarks of Formula One Licensing BV,a Formula One Group Company. Licensed by Formula One Administration Limited, a Formula One Group Company. All rights reserved.